With over 40 years of development, including six different versions of the rules and a multitude of settings, there is a lot of information within the Dungeons and Dragons franchise for the gamer to digest. Although the current numbering of D&D runs from the AD&D line, with the latest version known as Dungeons and Dragons 5th Edition (aka D&D Next), the original D&D line is still popular, with its iconic Known World setting, and is still ripe with inspiration for the modern gamer. In 1974, Dave Arneson and Gary Gygax released the first version of the iconic Dungeons and Dragons game through their new company Tactical Studies Rules, Inc. (TSR Inc.). In 1977, the decision was made to split Dungeons and Dragons into two separate product lines – Dungeons and Dragons (OD&D) and Advanced Dungeons and Dragons (AD&D). Of these two lines, OD&D would continue until 1991, while AD&D would continue until 2000. Following this time, AD&D would return once again to the name Dungeons & Dragons (D&D), and continues to this day in 2014. 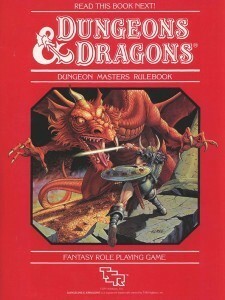 In the OD&D line, two rulebooks were published in 1981 – a Basic Rulebook and an Expert Rulebook. 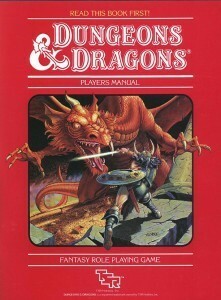 Developed by Tom Moldvay, this would become known as the (B/X) edition of D&D. In 1983, OD&D was released once again in a format developed by Frank Mentzer, that would become known as the BECMI edition following the release of the Companion, Master, and Immortals rules for D&D. This idea would also inform the labelling of OD&D products, with modules released for these various levels of OD&D being referred to as the B (Basic) series, X (Expert) series, C (Companion) series, M (Master) series, and I (Immortals) series. 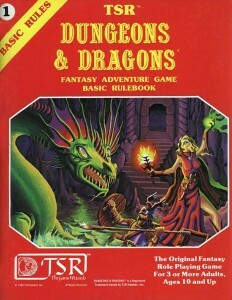 The Basic version of OD&D, in both the B/X and BECMI editions of the game, would focus on the early levels of the game. They would feature everything needed to play levels 1-3, and would largely revolve around dungeoneering. 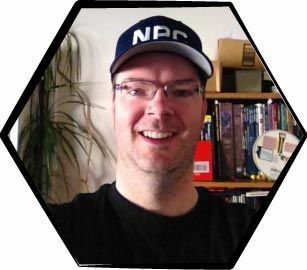 The focus was on getting players accustomed to the principles of the game, from which they could head towards either AD&D or the the Expert OD&D rules. This principle of expanding the focus of the game to include new types of adventures was fairly unique to OD&D, although the general principles of such progression can be seen in a range of different types of modules and supplements. This allowed starting GMs to begin playing with minimal fuss, and slowly expand the scope of their games as the players and their PCs gained experience. The core theme of the Basic version of OD&D was that of dungeon exploration. This has always been the simplest concept for players who are starting out with D&D, since the dungeon has always been considered a safe environment for the players to learn the fundamental concepts of the game. The main reason for this is because the dungeon represents a clear defining line for adventuring, with most games starting as the PCs approach the entrance to the dungeon. When the PCs leave the dungeon, it is easy to assume they make their way back to town, a typically safe haven where they can recover and prepare for their next foray into the darkness. In addition, dungeon environments have always been easy to control, particularly with the limited capabilities of the party at lower levels of the game. The GM could therefore direct the party through careful dungeon design and planning, without forcing the players to feel like they are being railroaded into taking certain actions. This allows for an easy control of pace, and gives the players a degree of freedom to direct their adventures as they explore the dungeon. Basic OD&D also contained a number of tools for the GM still useful in today’s game. They included a method of stocking a dungeon using a randomised approach, and allowing for a variety of encounters and challenges to be created fast. These tools could fill even a large dungeon in little time. They could also be used to provide inspiration for the GM, who wasn’t tied to the randomised rolls in any way, should they come up with something more fitting. Even then, the GM could get away with results that didn’t seem to fit, and leave it to the players to come up with theories about why things the way they were. A canny GM could listen to the speculation of their players, and even adapt some of these ideas into further adventures. In contrast to today’s balance-heavy rules, basic OD&D followed a more status quo approach to encounter design that gave the PCs more freedom to choose what they felt they could handle. Dungeons were assigned a level, which determined roughly how strong the encounters and challenges would be. As a rule of thumb, the level of a creature was typically equal to their Hit Die, but special abilities could make creatures higher level. Each creature would also be defined to have a number appearing, and it was possible to see these creatures in higher or lower levels, in either increased or decreased amounts, respectively. This principle is still seen in today’s D&D. The difference comes down to the fact that little or no regard was given to the size of the dungeons or the number of encounters within. Changes in dungeon level were fairly obvious – typically a set of steps or a barrier of some kind would highlight such a change. This allowed the PCs the opportunity to choose whether or not they felt they could take on the challenges ahead. If they didn’t think they could survive, they could always stay on the same dungeon level and explore some more, gaining experience until they felt ready to move on. This approach represented a different style of pace to what we see in D&D now. The current trend for adventure design is to use a planned story or adventure site designed with the idea the characters will gain a level after so many encounters of that level. This tends to make for tighter, and shorter, adventures but this is often at the expense of player freedom. One of the more common ways the GM could control transfer between dungeon levels was to place obstacles that would prevent the party from entering the level if they either hadn’t faced enough encounters or reached the requisite level. These barriers could be as simple as a magically locked door that requires a key, so a pit that can only be safely descended using levitation. By using such methods, the GM could ensure the party had access to a particular ability and thus had a reasonable chance to survive the dangers within. One major difference we see between the Dungeons and Dragons game today and that of basic OD&D is the importance given to finding treasure. In OD&D, PCs gained the majority of their experience by finding treasure and getting it out of the dungeon. Although combat was common, only a minority share of experience actually came from fighting creatures, encouraging alternative methods of dealing with encounters. Because of how dangerous combat was, combat was largely seen as a failure state or a method of last resort to get at the creatures’ loot. Bribery, diplomacy, deception, intimidation, and stealth were all possible ways for the party to bypass creatures, and possibly divest them of their wealth. It also meant there was an incentive for the party to let creatures live, as they could typically buy their surrender by giving up their treasure. This focus on treasure hunting had another major impact on the game: encouraging GMs to be sneaky when designing their adventures. Treasure could be hidden in all sorts of places, and could often be used as bait for traps. Treasure could also take a number of forms, and the party might have to come up with creative solutions to get the treasure out of the dungeon. Small furnishings might be easy to carry – silver cutlery or a valuable tome of lore might be stuffed in a backpack with little fuss. Yet, there could be fine tapestries, giant marble statues, and even natural gold veins that would take a lot more effort to exploit. This also made another type of treasure important – the treasure map. A map to a cache of 50,000 gold pieces worth of treasure could easily lead to an adventure where the PCs could gain enough experience to advance an entire level. It was up to the GM to make the PCs work for this, whether it was requiring a cunning plan to extract the treasure, or providing traps and creatures to be thwarted to reach it. In OD&D, a simple treasure hunt was enough of a motivation to get the players involved, and this is an idea easily adapted for today’s games. Dungeons – Dungeons are easy to design and control, and they are the perfect sandbox adventuring environment for low level characters and new players to explore while learning how to play. What happens in the dungeon, stays in the dungeon. Dungeon Levels – For a change of pace, try swapping the encounter-based approach with a more exploration-focused method, using obstacles and barriers to give the players a meaningful impact on how the adventure progresses. Interesting obstacles can provide unique challenges for the party to overcome. Treasure Hunting – Consider using a treasure hunt as a basis for an adventure, including treasure maps leading to hidden loot, and an experience reward for successfully retrieving the treasure. Be creative when designing treasure and where it is hidden. It might seem unlikely to find inspiration from earlier products, especially ones just a rulebook to a previous edition of Dungeons and Dragons. But there are still great ideas here you can use for inspiration. Using the inspirations behind dungeon design and treasure hunting as the primary features of Basic OD&D, you can generate ideas for your adventures that are much more than simple monster fests we often see in the current iteration of the game. You might not be able to teach an old dog new tricks, but you can certainly teach a new dog some old ones!